Make Cambodia a great experience for your family customers. We work with travel companies and hotels to offer specialized children’s travel activity books which make Cambodia a more fun and educational travel destination for families. Our team knows what family travellers with young children are looking for during their holiday in Cambodia, and the Cambodia Kids! travel guides can help you offer that experience to your family guests. Parents love to keep their children engaged and learning when they travel. We offer two Cambodia Kids! guides to help families experience this: the Cambodia Kids! Scout guide for young children ages 4-6 yrs and the Cambodia Kids! Trailblazer guide for children ages 7-11 yrs. 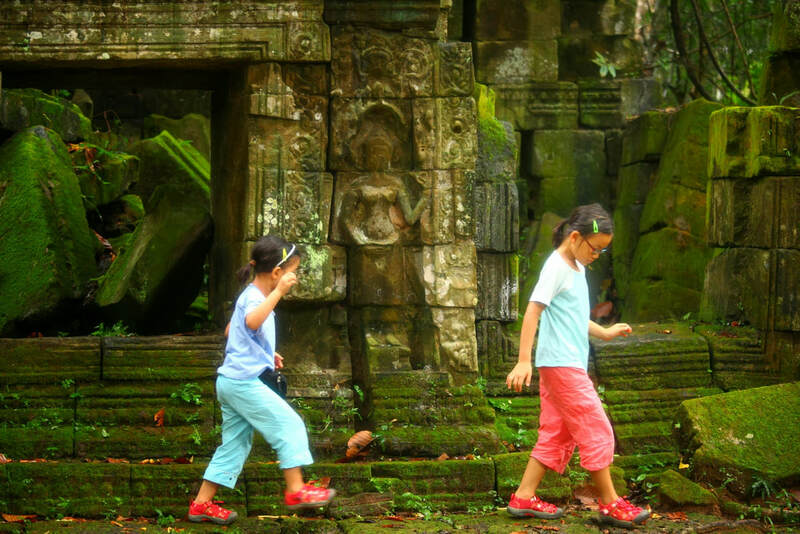 Both travel guides tell stories about ancient Cambodia and include activities for children to complete while they visit the temples, markets, and other destinations. "Journeys Within has been using Cambodia Kids since 2016. Our family groups enjoy using these travel guides. We regularly receive comments from parents on what a wonderful way these guides are to keep their children entertained and involved in their tours. Our guides also enjoy using this interactive tool on their temple tours, saying that it is a fun way to keep the kids engaged." "(Our young) Caring for Cambodia volunteers enjoy the Cambodia Kids! travel books.... The books help bring context to where they are and what to look for while visiting Cambodia. The books are interactive and so well thought out. We love being associated with such a quality publication." If there’s one travel book I would wish for every kid out there – it’s their own travel journal filled with their travel experiences, thoughts, and opinions. The Cambodia Kids! travel journals are that and more. We ship via DHL to most international destinations. Shipping time from order date to delivery ranges from 4-6 weeks for bulk purchases. Contact us for a quote. Greenfeet Guides are available in a print book format OR as a PDF download, which your company may print and make available to your customers. PDF pricing will depend on the number of copies you intend to print. Please fill out the inquiry form below to get a quote. After purchase, PRINT copies of Greenfeet Guides MAY be resold through your distribution channels with no further commission due to Greenfeet Guides. However printing from the PDF is limited to the number of agreed upon copies. For orders of fewer than 10 books, please order through our online Shop. ​For volume discounts, please submit the inquiry form below.